Bob Reid – “Jaeger & Reid”, Judi Jaeger (JAY-gur) & Bob Reid, hail from Canada and California, respectively. Their music is a rich stew with Pete Seeger as the base. Add some chopped Streisand, a few stalks of Sam Cooke, a dash of Leonard Cohen, a pinch of Richard and Mimi Fariña, and sprinkle in some Joan & Joni, Peter and Mary, or Mary and Paul. They sing songs gathered from their lives: many original, some collected from friends and some passed on from singers no longer around to share their own music. 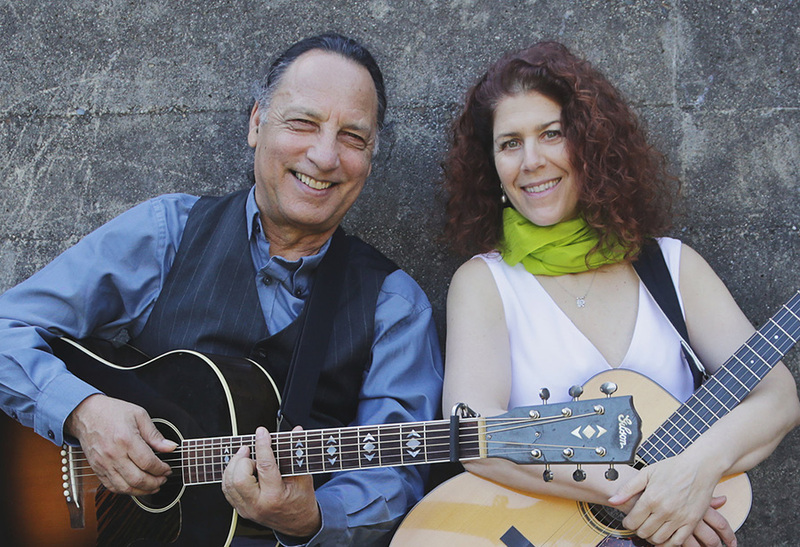 For the past three years, Judi and Bob have been traveling the continent with their luscious harmonies, intelligent writing, intertwining guitars and deep concern for the human condition. Their first album “From Way Up Here” was released in 2017. They are busily at work on the next. They will return east from California to appear at the People’s Voice Cafe in Manhattan on Saturday, September 14. Judi grew up near Montreal, Canada. Her home was full of music from her mother and brother playing guitar and singing. Her mother also performed with a local Gilbert & Sullivan company. Judi put aside her own guitar playing while she pursued a career in law and raised a family. She began her journey as a performing songwriter as an expression of her loss after the death of her mother who suffered a form of dementia. Her audiences are glad she did. Bob is a fourth generation Californian, who grew up surrounded by music. His mother, Betty Reid Soskin, now known, at 97, as the oldest National Park Service Ranger, performed in coffeehouses in the 1960’s, while his father owned record stores and promoted gospel concerts. He is a veteran of Clearwater’s Pumpkin Sails in the 80’s and 90’s, as well as the Hudson River Revival as a performer and litter-picker. Bob has performed at the United Nations in New York, at festivals, concerts and in schools across the United States, for audiences of all ages. His original songs have been recorded by Pete Seeger, Bill Harley, Cathy Fink & Marcy Marxer, David Grover and many others. Bob was invited by the Seeger family to perform at memorial concerts for Pete and Toshi Seeger.